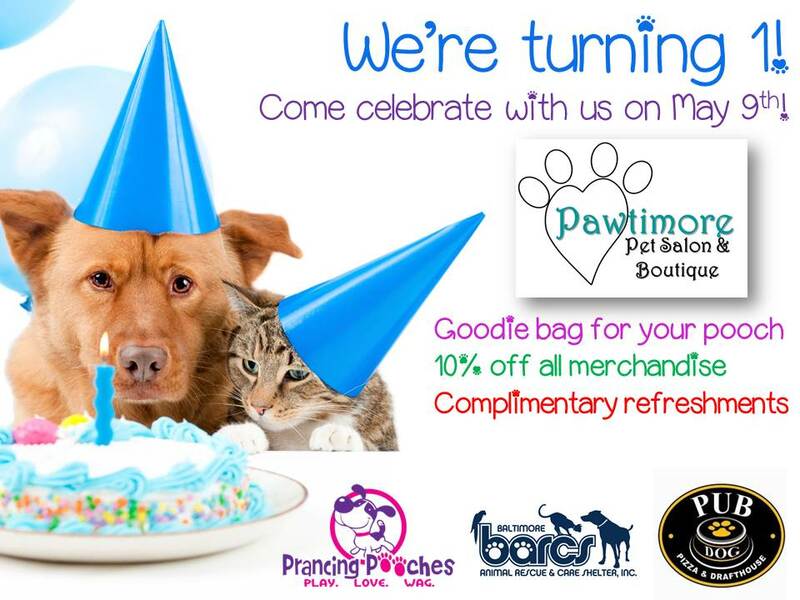 Pawtimore is “leader of the pack” in the local dog-grooming industry, and now Baltimore’s finest pet salon and boutique is turning 1! Located in the heart of Historic Federal Hill, this “groomery” offers multiple packages specifically designed to cater to all four-legged friends who venture through their doors. Also showcasing an impressive selection of quality pet accessories and apparel, Pawtimore offers a complete line of cleaning and hygiene products for man’s best friend, and a remarkable variety of gourmet treats stylistically made right on location. So come on down on Saturday, May 9th from 10am-3pm and have a few wags with us! Throw your name in the drawing for a door prize and enjoy a complimentary sangria or microbrew. Take as many treats as you’d like, because there’s sure to be plenty! Loki’s Lifestyle and Pub Dog Drafthouse will be joining us on-site, each featuring unique promotions for this special event. We’re looking forward to shaking your paw, and can’t wait to see you there!